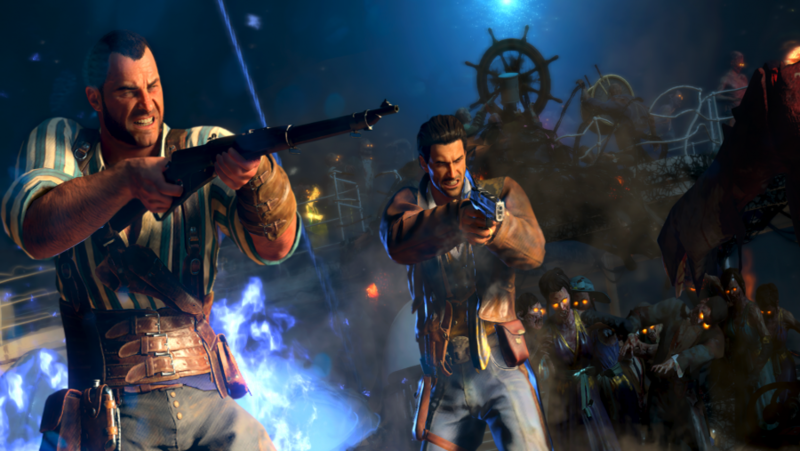 The Voyage of Despair Pack-a-Punch machine can be pretty tough to unlock, and you’ll definitely need some upgraded weapons in order to survive for very long on this challenging zombies map. Unlocking the Voyage of Despair Pack-a-Punch machine requires unlocking nearly every area of the ill-fated ship so start stockpiling points the second you spawn. In this micro guide we’ll show you how to quickly and efficiently access the Voyage of Despair Pack-a-Punch machine so that you’re well-equipped to take on the undead hordes. But before we begin, it’s important to note that there will be a few minor Black Ops 4 Zombies spoilers below, so click away now if you want to go into this zombies map fresh. In order to unlock this upgrade machine you will have to track down four slabs across this especially labyrinthine map. Once you’ve tracked down all four and activated them then the Voyage of Despair Pack-a-Punch machine will spawn at one of the four slabs. You can find out which one by looking at one of the slabs: there will be a light that shows which of the four spots the machine can be found at. The first two spots you should aim for are the poop deck and grand staircase: the former is at the very opposite end of the ship while the latter is a few floors below deck in the middle of the ship. Head towards the poop deck first as this provides you with one of the map’s largest areas to kite packs of zombies in. For the grand staircase Pack-a-Punch slab you will need to clear some debris to access the lowest section of this arterial flight of stairs – try to do this between waves of zombies as it’s an easy spot to get stuck in. The next two are in the cargo hold and turbine room, which are a little trickier to find. For the cargo hold you’ll want to head to the starting area of the ship, called the forecastle, and open up one of the white doors at the back – alternatively, you can drop down through a nearby breach in the deck. Head down the staircase until you reach the flooded cargo hold. The Pack-a-Punch slab in this room can be found close to the Titan wall weapon. Finally, you’ll need to track down the turbine room. To reach this room you’ll need to head through a white door near the front of the poop deck, head through the 3rd class berths until you find a drop down to provisions, and follow until you reach an openable door adjacent to a meat locker. This door will lead you to the engine room, from here head down a flight of stairs until you’re at what looks like the bottom of the floor. Look around for some floating debris, clear it, and dive into the murky water – turn around as soon as you’re underwater and you should spot the final slab. There is a valve you can interact with that will drain the water in the room, making using the machine and getting around in the turbine room painless. Be warned: the Voyage of Despair Pack-a-Punch machine will change locations between the four slabs, so make sure you check where it is before delving into the depths of the ship in search of an upgrade. That’s it: how to unlock the Pack-a-Punch machine on the Voyage of Despair Black Ops 4 Zombies map. This is a very tough map owing to the tight corridors and confusing layout, so accessing this gun upgrade machine will be vital for a successful run. We also have a guide to unlocking the IX Pack-a-Punch machine if you’re having trouble figuring out the various mysteries around the arena.